Sophia Chang started Kitchener Oakland in 2012. The incubator kitchen hosts 30-plus micro food startups, with new ones coming onboard about every month. In February 2014 she successfully crowdfunded Kitchener Snack Bar, two takeout windows at the facility where resident artisans can promote their products. The campaign exceeded her $25,000 goal by 20 percent, raising $30,000 from more than 500 backers, whose donations averaged a mere $56 each. Here are her seven steps to crowdfunding success. I tell people that you need a month or two to prepare a compelling and thoughtful campaign. When it goes live, you can expect to work full-time, forgoing social activities that aren't relevant to the campaign It truly demands the same amount of time as a full-time job. You basically go out on the campaign trail, and try to be as charming and convincing as you can be. There's a certain finesse to it. Then after the campaign's over, give yourself a month or two to detox. Most of our rewards for pledges were meal credits for artisan-made foods from Kitchener Oakland. The rewards were really generous; many were worth more than the actual donation. For our campaign site, we created new content every two days, a total of 14 times, to keep ourselves relevant, to avoid getting pushed to the bottom. We didn't want to just say donate, donate, donate. We made half a dozen videos about our artisans, and two of me. (Crowdfunding also taught me video-making skills, because I'd never made a video in my life. Our main video was made by a friend, but we made all of the updates.) We also posted lots of pictures. But that's why you need to set aside a month to stay home—you're online, updating and promoting your campaign. Most of our artisans messaged and posted about the campaign, and we shared updates about it on Facebook and Twitter. We paid Facebook $400 to boost our posts, so they made a lot of money off us. People can be wary of crowdfunding now, since some successful campaigns never followed through. We were hyper-transparent, posting when we got our permits, anything to let people know they didn't donate in vain. It's really important to taper off any social media posts once your campaign is done. Like I said, it takes two months of detox. You don't want people to feel bombarded. Crowdfunding helped me immensely because I'm someone who doesn't ask for help. It's in the nature of entrepreneurs to not to—they'll try to do everything by themselves until they can't take it anymore, then they'll hire help and they're still micromanagers! Not to get too mushy about it, but crowdsourcing forces you to accept help in this way that's really healing. It was overwhelming to feel the community support. The campaign also got us exposure we never would have gotten had we gone to private donors. 1. 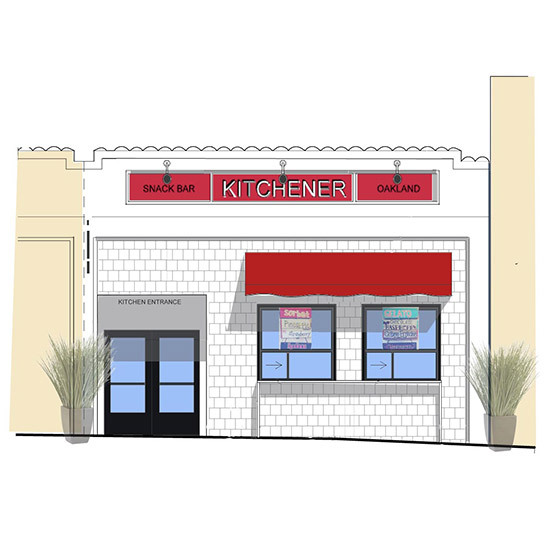 Kitchener snack bar: The takeout windows should open in late April. Our artisans can rent one window solo for $10 an hour, or two people can pair up and rent one window for $5 an hour each. 2. Kitchener Collective: In May 2014 we're opening a retail concept in Corte Madera, California. Similar to the La Cocina kiosk concept at the Ferry Building in San Francisco, it will feature our artisans' products. We'll have foods like pies, empanadas, cold-pressed juices, and heat-and-serve meals that families can take home, like slow-food TV dinners. 3. Gluten-free Kitchener: We're opening a gluten-free incubator facility near the Oakland Coliseum in fall 2014. 4. Kitchener Hayward: We're opening a second incubator in the East Bay in 2015.